We love salmon around this house, and have it quite often. But it is always prepared the same way, usually with the same sides. I don’t think I’ve ever ordered salmon while dining out either, as I am afraid it won’t be as good as at home. Yet, while browsing through Food & Wine magazine online a few months ago, I came across this recipe and for some reason I had to make it. There was something about the ingredients that spoke to me, and the next time I had a salmon craving, this recipe ended-up on our table. Actually, the first time I made it CH wasn’t home, so it was all for me. The second time, CH was home and devoured the meal. Other than saying “nom, nom, nom….this is good”, CH remarked at how quickly it appeared on the table. And he is right. This dish comes together very easily, doesn’t dirty a lot of dishes, but pleased every one of our taste buds. So if you are looking for a way to mix-up your salmon routine, definitely give this recipe a try (and don’t be scared of the ingredients – the flavours are actually quite mellow)! The leftovers also taste delicious the next day over a salad. Preheat your oven on the broil setting High. Line a baking sheet with tinfoil, and place a wire-rack on top. Lightly grease the wire-rack. In a small bowl, stir the cumin with the chili powder, brown sugar and coffee. Season generously with salt and pepper. Brush the salmon fillets with olive oil and rub the spice mixture onto both sides. Meanwhile, in a food processor or blender, puree the tomatillos with the cilantro, jalapeño and garlic until smooth. Add the sour cream and process until smooth, then add the avocado and pulse until creamy. Transfer the dressing to a large bowl and season with salt and pepper. Add the cabbage and toss to coat. Place the salmon fillets on the wire-rack and place under the broiler for 6 minutes, turning once, and cook for an addition 4 minutes, until opaque and cooked through. Transfer the salmon to a plate and flake with a fork. 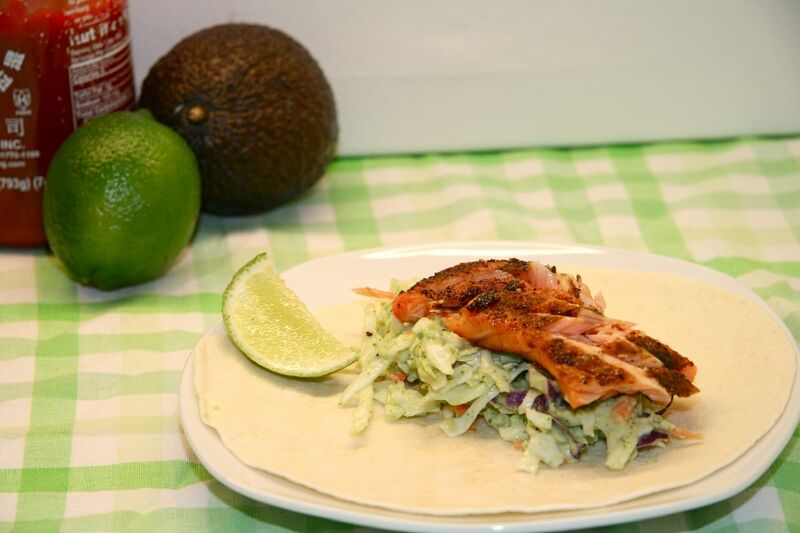 While the salmon is cooking, lightly brush each tortilla with olive oil. Stack the tortillas and wrap them in foil and place them in the oven for a few minutes with the salmon (bottom rack) to warm. Recipe slightly adapted from Food & Wine Magazine.